Bipartisan groups of lawmakers in both the Senate and House have been working on bills to overhaul the nation’s immigration laws, and those efforts will be at center stage as Congress returns to work this week. Key issues under discussion have been creating a path to citizenship, border security and shaping a guest worker program for low-skilled labor. A survey in March found that 71% of Americans say there should be a way for people in the United States illegally to remain in this country if they meet certain requirements, while 27% say they should not be allowed to stay legally. 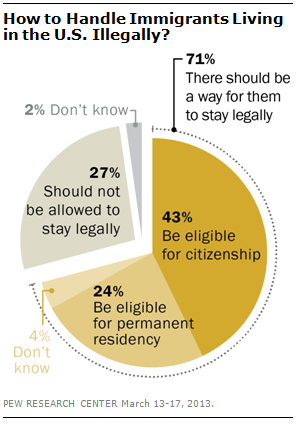 But there is a division of views among the 71% who support finding a way for immigrants here illegally to stay. Roughly four-in-ten (43%) of the public says unauthorized immigrants should be allowed to apply for citizenship, but 24% of the public says they should only be allowed to apply for legal residency. In 2011, there were about 40 million immigrants in the United States. Of that total, 11.1 million, or 28%, were in this country illegally.